We can get our photos deleted from an Android phone due to different reasons. A wrong update, halted rooting process, and malware attack are some of the common reasons. There are times when photos are deleted from our phone accidentally as well. If you are also suffering from data loss on your phone, then don’t worry. We will teach you how to recover deleted files on Android without computer. Read on and make yourself familiar with a foolproof way to recover deleted photos Android without computer. Part 1: How to recover deleted photos on Android without computer? If your photos have been deleted from your device, then you can easily restore it by taking the assistance of Dr.fone Data Recovery App for Android smartphones. Without the need of connecting your phone to the system, you can use the app and retrieve your photos, videos, and messages. The application is compatible with Android devices running on 2.3 and newer versions. Though, your device should be rooted to run the application (the recycle bin feature works on non-rooted devices as well). 1. Start by installing the app on your Android device. You can download it from Play Store right here. 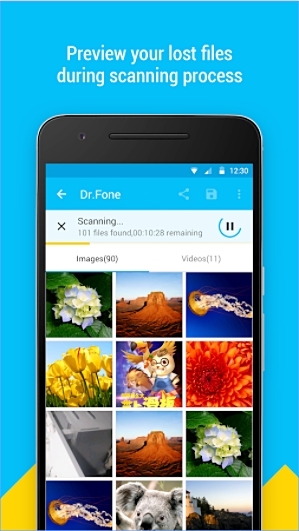 Whenever you wish to recover deleted photos Android without computer, simply launch the app. 2. It already has a recycle bin, which stores the deleted files for the last 30 days. If you wish to recover dedicated data files for even an older duration, then simply tap on the data option of photos & videos, contacts, or messages. 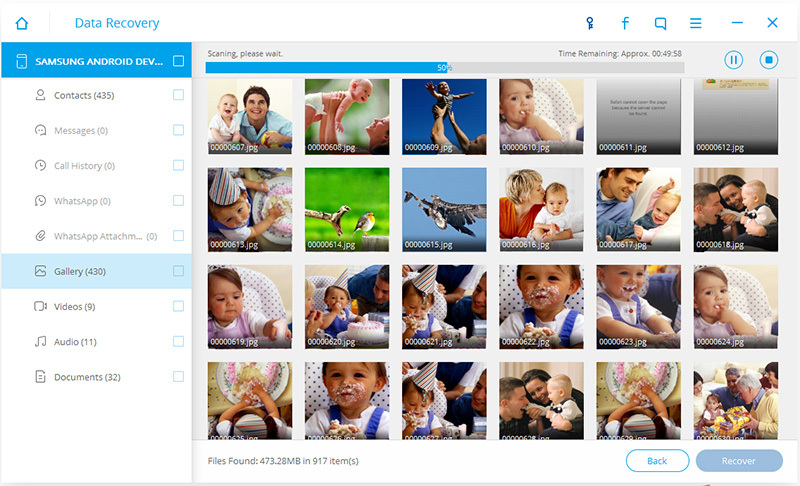 Select the option of “photos and videos” to recover your deleted pictures. 3. The interface will ask you to select the type of files you wish to scan. If you are not sure, then you can select all the types and tap on the proceed button. 4. 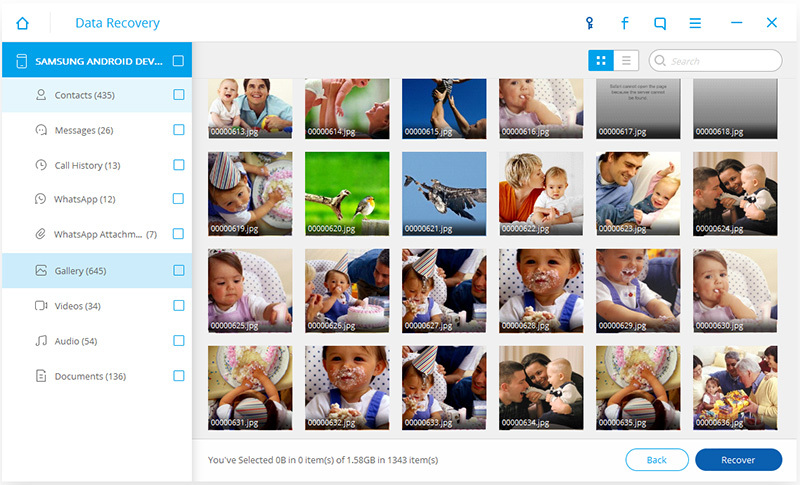 This will initiate the recovery process as the application will try to retrieve your previously deleted photos. 5. When it is done, you can simply preview the restored files. 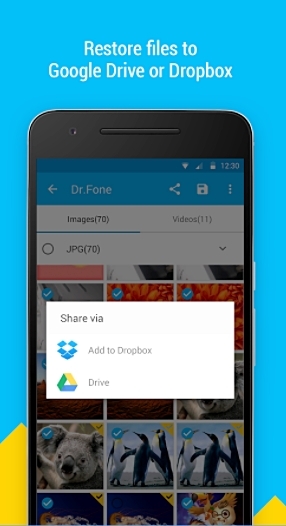 Furthermore, you can upload your files to Google Drive and Dropbox as well. 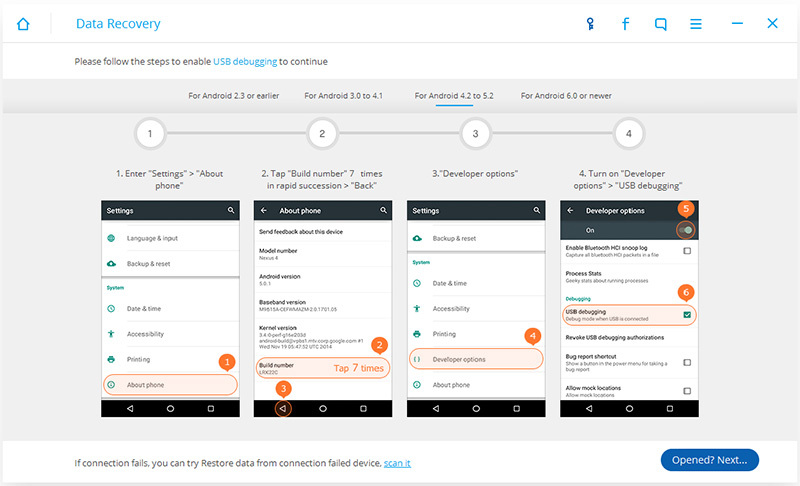 After performing these steps, you would be able to learn how to recover deleted files on Android without computer. 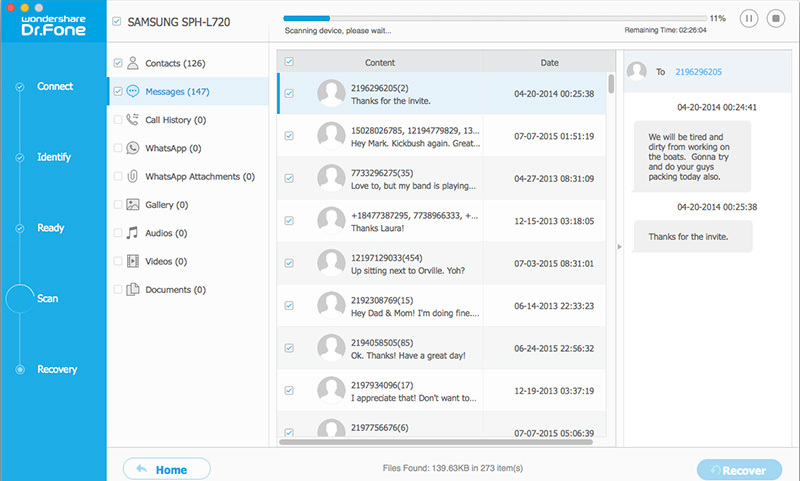 Part 2: How to recover more deleted files on Android? 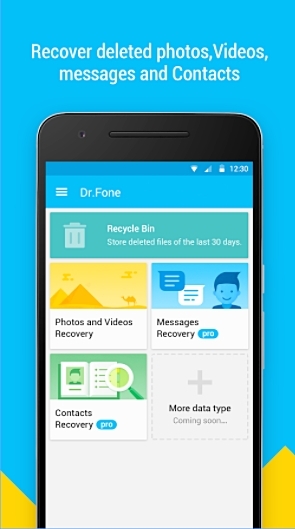 By using the Dr.fone Data Recovery app, you would be able to retrieve contacts, videos, photos, and messages. 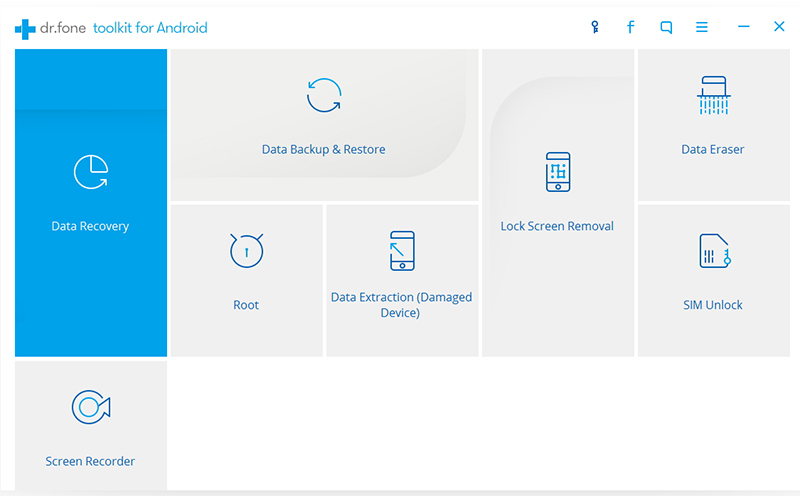 Though if you wish to recover different kinds of data files like call logs, calendar, notes, in-app data, and more, then you might need to take the assistance of Dr.fone toolkit Android Data Recovery. 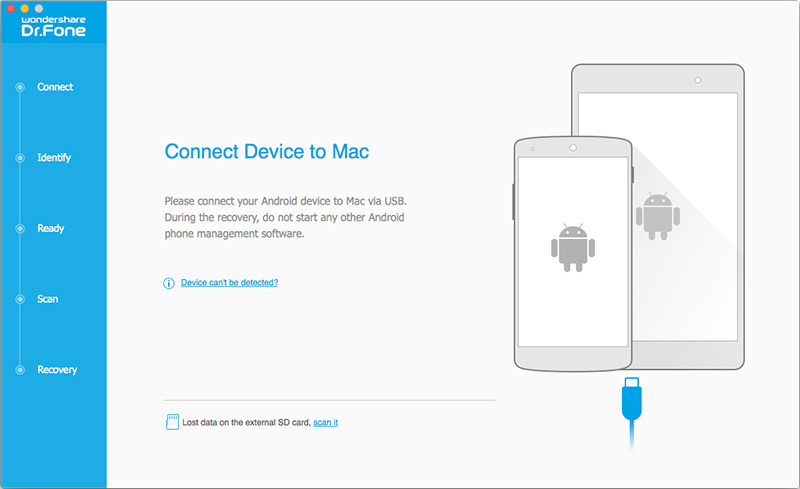 It runs on Windows and Mac, and is already compatible with every leading Android device. With it, you can perform a comprehensive recovery of your data in no time. 1. 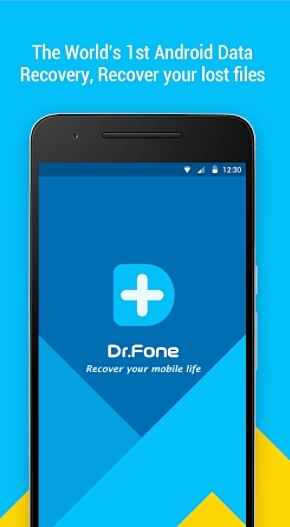 Install Dr.fone Android Data Recovery on your Windows from here and launch it whenever you wish to perform the recovery operation. From the welcome screen, tap on the feature of “Data Recovery” to continue. 2. Now, you need to connect your Android device to the system. Before that, make sure that you have enabled the option of “USB Debugging” on your phone. You can follow the on-screen instructions to do it. It can be done by visiting Settings > Developer Options and turning on the feature of USB Debugging. 3. 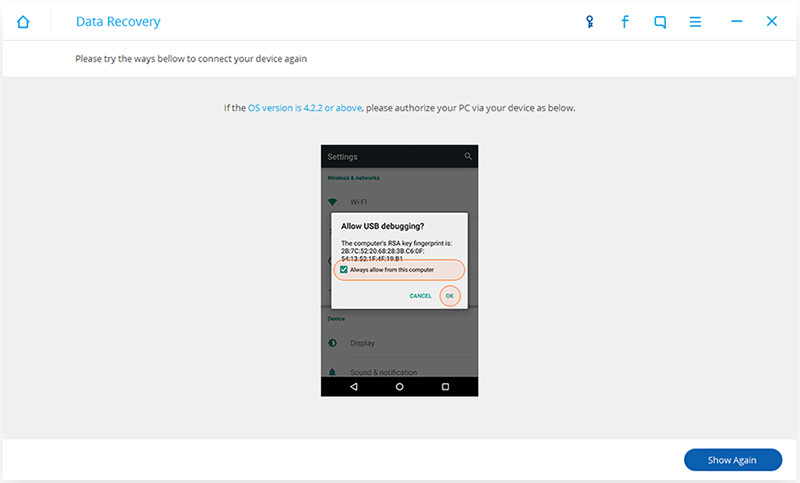 When you would connect your device to the system, you might get an additional pop-up regarding the permission to perform USB Debugging. Just tap on the “Ok” button to agree to it. 4. The interface will provide a list of different data types that can be recovered. Just enable the checklist and click on the “Next” button. 5. 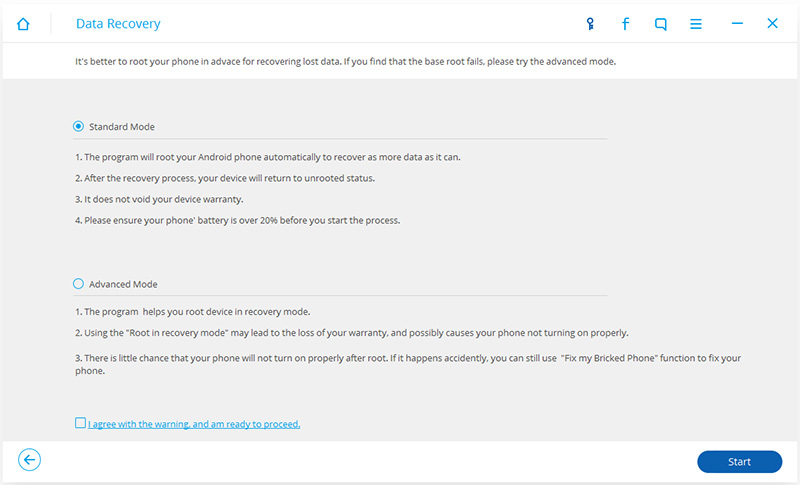 From here, you can pick the kind of recovery mode you wish to perform on your device. It could be either Standard Mode or Advanced Mode. Select the desired option and click on the “Start” button. 6. Wait for a while as the application will start performing the recovery operation. You can get to know about its progress from an on-screen indicator. Make sure that your device is connected to the system during this stage. 7. When it is successfully completed, you can simply get a preview of your data. 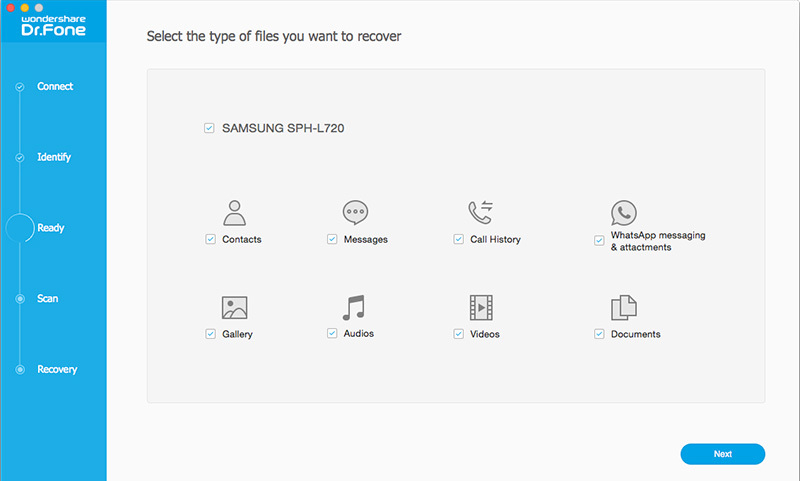 Select the data files you wish to save and click on the “Recover” button. 1. Install the application on your Mac and launch it whenever you wish to recover lost data from your Android device. You will get a screen similar to this. 2. Now, connect your device to the system using a USB cable. Wait for a few seconds as the application will automatically recognize it. 3. Once it is done, you will get the option to select various data types that you wish to recover. Select your desired options and click on the “Next” button to initiate the process. 4. The application will start retrieving the deleted files from your phone. After completing the process, your files will be listed in different categories. Just make your selections and click on the “Recover” button to retrieve your data. This is a highly convenient option if you are willing to connect your phone to the system. It also provides an added feature to perform an extensive recovery of your data. Though, if you are in a hurry, then you can always give Dr.fone Data Recovery app a try as well to produce fast and reliable results. 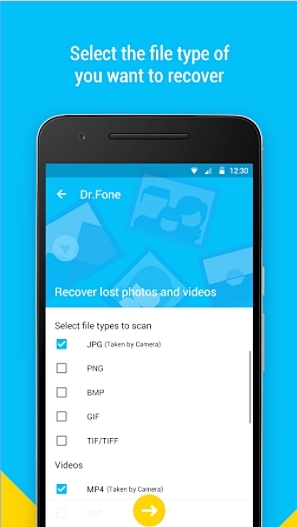 You can simply use Dr.fone Data Recovery app to recover deleted photos Android without computer. Though, if you need to perform an extensive recovery of your data, then you can also use the desktop version of Dr.fone Android Data Recovery software. Now when you know how to recover deleted files on Android without computer (and with computer), you can certainly retrieve your data in no time. Go ahead and pick your preferred alternative! This article introduces you to the top 5 free recovery software for Android, along with the best Android data recovery tool till date.